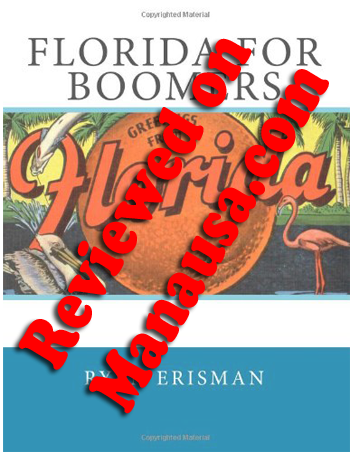 If you are thinking about retiring and moving to Florida in the next few years, you might want to get the book by Ryan Erisman titled "Florida For Boomers." I'm sure that every state has its own process, procedures, terminology, and pitfalls to avoid in the real estate market, and Florida is no exception. We have a spotted past when it comes to "luring" northerners to our State for the purpose of retiring, so Mr. Erisman has produced the first real guide to Florida For Boomers . I saw another review of Florida For Boomers that basically said this book was full of information that can be found from many other free sources, such as real estate agents, builders, city offices, county growth management divisions, and chambers of commerce. But to me, that is kind of the point here. If you are thinking about making the move to Florida, you probably don't have a cadre of all these people, and certainly you don't have them producing a clear and concise reference material for you that is assembled like the Florida For Boomers book. Florida For Boomers is a 150 page resource book that addresses most, if not all, of the concerns that I have typically dealt with when working to help somebody choose Tallahassee to retire. The topics are well covered, but general enough in nature not to make the book read like a government operations manual. Of course, the details that flow from each one of these topics in Florida For Boomers is comprehensive, and I think plunking down a mere $20 before making a decision on where to move is a no-brainer. I think anybody thinking about retiring in the next ten years could gain a lot from Florida For Boomers. Even if your ultimate destination ends up being outside of the state of Florida, you will have a great guide to gather the information that you need in that ultimate destination. If you want to see some excerpts from the book, just go to Amazon to preview some pages of Florida For Boomers , you'll be glad you did.